It seems every time I run a race dozens of people catch up to me (or zoom past me!) and say, “Can I ask you a personal question?” I feel I can almost read their minds because the question is usually, “How did you loose your leg?” If I’m at the mile 3 mark I’ll put some detail into the story, but if I’m tired, say at mile 19, I’ll give them the Readers Digest version. Since I’m now sitting in a comfortable chair and wearing my favorite sweat pants get ready for some detail. I’ve always been out going and athletic. 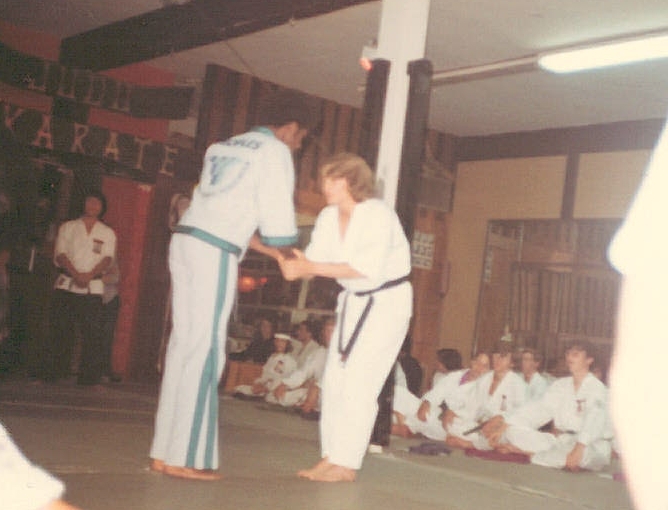 I earned a Black Belt in Karate at 16 years of age. 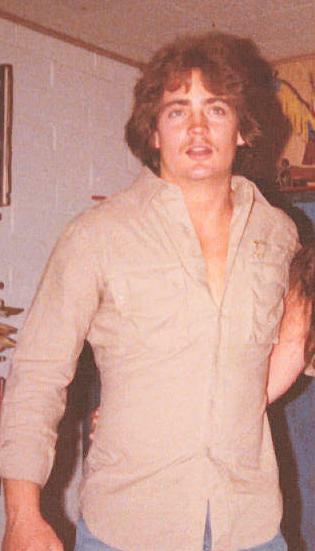 I spent a lot of time at World Gym in Santa Monica, California, lifting six days a week for two hours a day. Back in those days it wasn’t unusual to see Lou Ferrigno who played the ‘Incredible Hulk’ doing bench press back in the corner. I did it all, surfing, swimming, snorkeling, skiing. At 20 I was truly invincible. One morning in May of 1981 while riding my totally awesome Kawasaki 650 motorcycle to Los Angeles Valley College, the unthinkable happened. Actually I don’t really recall much, what I do was terrible. My first memory was opening my eyes and noticing I was laying in the center of a white room. There was a young woman dressed all in white with her back to me. She was busying herself with some work or something. I figured I was dreaming so I thought I would amuse myself by finding out just how detailed I had made my dream. I opened my mouth and started to ask her where I was but instead I coughed up a small amount of blood. Hearing me cough she instantly turned around and spoke to me in a whispery voice, “You are safe”, she said. I thought “Who talks all creepy like that in real life? Holy crap, I think I’m in Heaven”. She continued, “You have been in a motorcycle accident and are in the hospital. Lay still and remain calm.” (Yea, she really said that too! )Well this was so funny to me I tried to laugh out loud but only managed to cough again. I congratulated myself for being so imaginative. Heaven, Angels, Accidents. This dream had it all. Looking back I’m sure the pain killers they had me on helped a great deal. I drifted in and out of consciousness several times over the next few days finally realizing that I was not dreaming but had in fact been in an accident and was in the hospital. The angel at my bedside turned out to be my nurse. Doctors and nurses continued to treat me and tell me of my condition. I was so out of it that most of what they said seemed more like hallucination than anything. One morning I was awoken by two male nurses holding my leg down on the bed very tightly while the doctor used a hand held drill to drill a hole through my thigh. I watched as the drill bit popped out the other side of my leg and a long piece of blood and (meat?!) shot on the floor. I passed out from shock and when I awoke I saw they had put what looked like a silver knitting needle through my thigh and had several pounds of weights tied to a rope and pulley system which hung off the foot of my bed. The doctor was very concerned that I might not be able to move my legs or walk ever again. I soon learned the stark reality of what had happened that day on my way to college I was hit head-on by a large garbage truck while on my motorcycle, no helmet, no boots, no brains. I broke almost every bone in my body and spent one year in and out of the hospital (the first month of it was in a coma). My teeth were broken out of my mouth as well and so there for awhile the dentist and I became very acquainted. I had multiple fractures in my hips, arms, legs, ribs and face. I also dislocated my leg from the hip. I probably should not have lived. When released from the hospital, I was still unable to use my legs. My spinal cord was bruised and the doctor wasn’t sure if the feeling would return to my legs or not. Miraculously it did but my lower leg was crushed and could not be saved. I had to make the decision to have it amputated. I was out of the hospital and living on my own at this point. After seeing my doctor and scheduling the operation I went home. Several days later when the time came to go to the hospital for the amputation I chickened out. I ignored repeated calls from both my doctor and the hospital but in the end after several weeks of thinking about it I scheduled the amputation again but this time went through with it. Looking back it was the best decision I could have made. I have had more than a dozen operations on my legs, arms and face and for years carried so much metal screwed to my bones that I dreaded going to the Airport. Every time I went through one of those metal detectors the thing would light up like a Christmas tree. I ran out of insurance and so I received no physical therapy but had to do it all on my own. I had to teach myself how to walk again and then how to run again. Thanks for comment on my blog. I come to California about once a year. Next time I’m there we’ll have to get together. 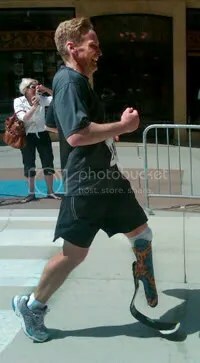 It was great to meet you yesterday during the 2011 Salt Lake City Marathon. You were an inspiration then, and reading your story are even more of an inspiration to me now. Consider joining our clubs: http://www.MarathonManiacs.com and http://www.50StatesMarathonClub.com. Neither are mine, and I don’t get a thing from them except for encouragement, camaraderie, useful tips, inspiration, motivation, and memories of a lifetime. Good luck on your goals. You can do it. Hi there! I ran a good bit of the Springfield run for the ranch marathon with you. I have finally found the website. I could not remember the name of it. It was an honor to meet you and run with you. I did get my maniac that day. I hope to see you again. Thanks so much for finding me and sending an e-mail. Congratulations on being a maniac! (that sounds weird) Hope you had a good look around my blog. I try to make it fun and interesting. I have a few photos of you from the Boston Marathon, if you’re interested send me a note, http://www.suddenlystillphotography.com and I’ll email them to you. You are very brave and I would like to thank you for that. Thank you so much for checking out my blog. I appreciate you taking your time to have a look at it. Thanks for the compliment. I met you last week at the Little Colorado. I admire you and your goals. I’m serious – if you can get to Georgia you have a place to stay! And I can probably find you some places to stay in North Carolina as well. Best wishes to you and your running! Tim, I understand Mississippi was on the cold side from Lyn. Still wanting to schedule some time w/ you guys. You are an inspiration to many who have to struggle to overcome seemingly insurmountable challenges. Thank you for sharing your experience! Found your blog through the Mormon YouTube video. I love what you’re doing with the marathons. I hope you get all 50 states!! Thanks so much, it’s been a lot of fun so far. I’ve got many more to do but I don’t see any reason to stop until I get all 50. Honestly when I was told by my doctor I may never walk again and here I am years later not only walking but running and not only running but running marathons I couldn’t be more thrilled. I just love to run and even after I’ve completed all 50 states I’m still going to get up every morning and run because I enjoy it more than anything else I can think of. You truly were an inspiration in the Andrew Jackson Marathon that you just ran.I have some pictures of you in the gym and then you crossing the finish line. My photos are from the side so you get a good view of the Cheetah in action. I will try emailing them to you. Wow. That was really terrible. I admire your courage and commitment! Good luck on your quest for 50 states!